Get the most out of your flooring investment with the luxury vinyl flooring from our well-stocked business establishment. We feature a variety of luxury vinyl tile (LVT) and luxury plank flooring at our flooring store. This type of resilient flooring is known for being extremely tough and long lasting. It also has the advantage of being stylistically flexible. You can acquire luxury vinyl floors that look like authentic hardwood, ceramic, or natural stone. Tell us what style of flooring you want and we will provide everything needed to put it in your home, including the luxury vinyl flooring installation services. Flooring manufacturing has come a long way in the last two decades. In the past, vinyl was looked at as an inexpensive flooring product for use in less prominent areas of the home. Today, luxury vinyl tile is virtually identical to many of the flooring materials it is designed to replicate. If you want the look of ceramic tile in your kitchen but desire more durability and ease of maintenance, LVT is the ideal alternative. You can get LVT flooring with the same colors and patterns of any ceramic tile product available. The same is true if you purchase luxury plank flooring and desire a specific type of wood species and grain pattern. The longevity and realistic appearance of luxury vinyl floors are why they are one of the most popular and cost-efficient flooring options available on the market. What if you could replace your worn out flooring with new floors that can withstand the wear and tear of daily use? Resilient flooring offers this exact solution in a number of different design options. 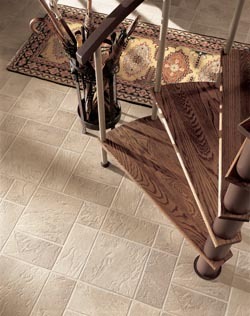 You can get new luxury vinyl flooring that looks like exquisite porcelain, but is much easier to maintain. This synthetic flooring is impervious to humidity and liquids, making it a fantastic choice for your bathrooms and kitchen. With this remarkable, highly attractive product, you never have to worry about warping, cracking, or mold growth. Do you want the genuine look of hardwood flooring without the cost or the effort to maintain it? Luxury plank flooring is the ideal alternative to hardwood because on the surface, it looks exactly the same as your favorite hardwood flooring option. When purchasing vinyl plank floors, you get to choose the exact wood species, grain pattern, and finish to replicate the real hardwood you desire for your home. The biggest difference is that vinyl flooring is easier to care for, saving you both time and money on the upkeep of your new floors. After you finalize the design of your flooring purchase, allow our experts to handle your hardwood floor installation. We have a network of skilled contractors with experience putting in luxury vinyl floors in rooms of every shape and size. We vouch for the people who perform the installations on behalf of our customers because we know firsthand the quality of the work they do. We are confident you will be completely satisfied with the results of your installation when you come to us for a luxury vinyl flooring installation. Contact us today to learn more about our selection of luxury vinyl flooring and let us know if you want to set up a time for an installation. We are convenient located to serve customers in and around Flint, Swartz Creek, Grand Blanc, Davison, and Flushing, MI.